You can watch the bridge’s peregrine falcons care for their clutch of eggs on the project’s FalconCam. As warm weather returns to the Hudson Valley, a pair of peregrine falcons have already made themselves comfortable in the Governor Mario M. Cuomo Bridge’s nest box. These remarkable creatures, the fastest members of the animal kingdom, can now be seen sitting on four eggs on the project’s FalconCam. This is the first nesting season for the migratory raptors in their new home, located near the top of one of the bridge’s 419-foot towers. While the local pair of peregrines roam the area throughout the year, the nest box provides prime real estate for the nesting season, which occurs annually in early spring. Environmental experts suggest that the same pair have resided in the area for many years, as the species tends to mate for life and are territorial. The birds previously lived in a nest box on the Tappan Zee Bridge. 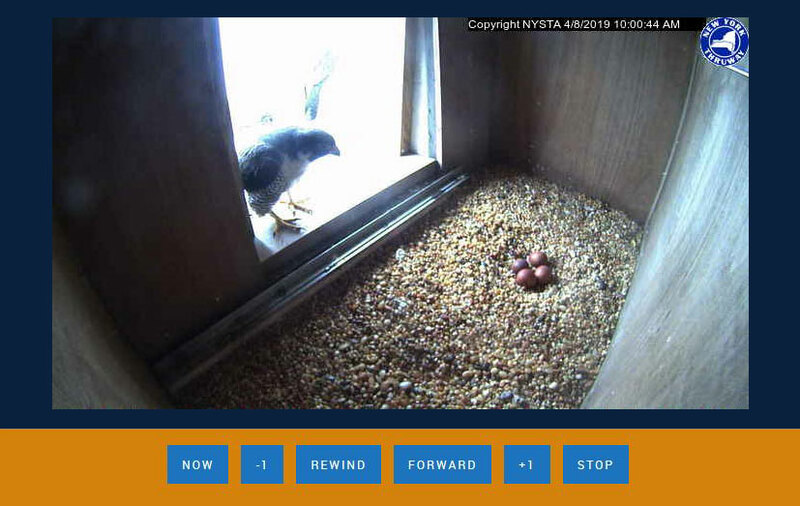 The nesting season occurs between February and April, with peregrines typically laying three to five eggs over the course of approximately eight days. The chicks, otherwise known as eyases, hatch approximately one month later. Over the following two weeks, the parents will care for their young almost constantly. As the nestlings age, they are left alone for longer periods of time until they leave the nest after approximately 40 days. As fledglings, the birds remain around the nest until they learn how to hunt and survive on their own. When young falcons mature, they can migrate great distances to establish nests of their own. When the eggs hatch, the Thruway Authority will once again hold a contest for the public to name the chicks. Stay tuned for details and, in the meantime, keep an eye on the FalconCam. You can receive updates on the project by following @NewNYBridge on Twitter.